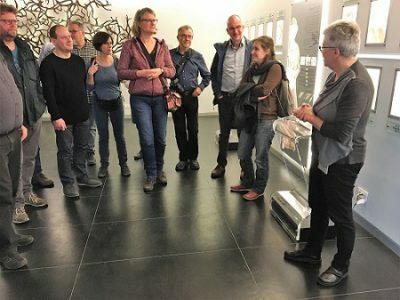 On January 21st a group of Evangelical Methodist Pastors and Theologians from around Germany visited Hadassah Hospital Ein Kerem. The group was led by Evangelical Methodist Pastor Walther Seiler, who was a former CEO of a Christian Hospital in Germany. 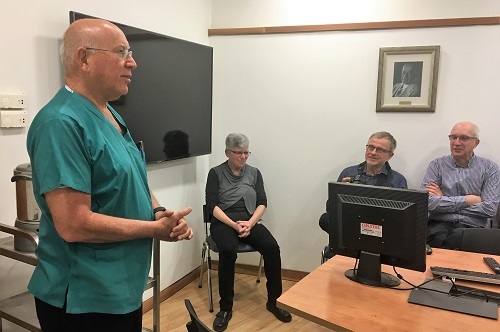 The German theologians, who are involved in Jewish – Christian dialogue, were eager to learn about the history of Hadassah in Israel as well the Hospital and its role in research and medical treatment in Israel and around the world. Their tour of the Hospital included a meeting with Prof. Jacob Pe’er, former Chairman of the Department of Ophthalmology. The Hadassah Ophthalmology Department is renowned for its outreach to countries across the world, and Prof. Pe’er was recently presented the International Blindness Prevention Award by the American Academy of Ophthalmology for significant contributions to restoring eyesight throughout the world. 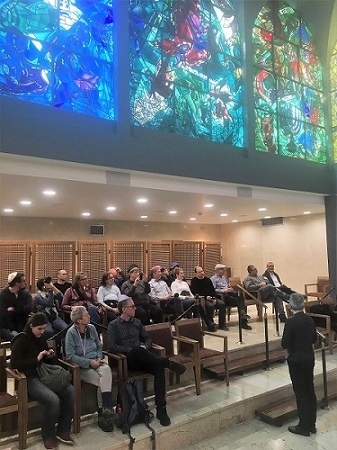 No tour at Hadassah Ein Kerem would be complete without seeing the beautiful Chagall Stain Glass windows in the Abbell Synagogue, and the visitors learned about the biblical meaning of each of the 12 windows as well as the history of the Hospital in Ein Kerem.